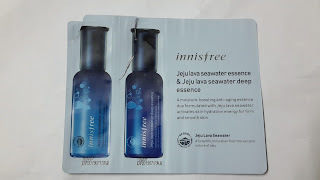 When I visited Innisfree last time to blindly purchase stuff because Innisfree products are the bomb, the staff was kind enough to include me a carded samples of their new Jeju Lava Seawater Essences. 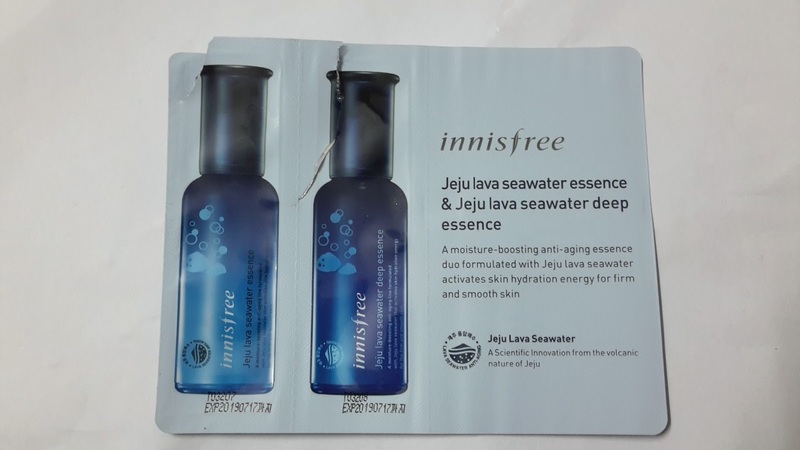 There were two type of essences sample on the card, one is the Innisfree Jeju Seawater Essence and the other is the Innisfree Jeju Lava Seawater DEEP Essence. The regular one is aimed towards users with normal skin while the deep essence is formulated for those with dry skin. Both boasted the moisturizing power of Jeju Lava Seawater, which I believe is just marine water near jeju with volcanic activities, therefore the seawater there is chock full of minerals that's probably good for the skin. The line is categorized as wrinkle care (anti-aging) but I think it's good for daily moisturizing purposes as well. After toning and sheet mask, I tested the regular essence on the right side of my face and the deep essence on the left side of my face to feel the difference. My skin is fairly normal but leaning on the oily side. The regular seawater essence is waterbased, and is very light. The scent reminded me of Tarte's Drink of H2O Hydrating Boost Moisturizer but not as strong, a kind of citrusy-jasmine kind of scent. It is completely not sticky and absorbs lightning fast. The texture actually provided my skin instant hydration and I really really like the formula. The deep essence however is formulated with micro ceramide capsules. It has the same scent but fairly thicker than the regular one. Upon spreading it onto my face, I feel a little bit greasy due to the emollient properties, but on the back of my hand, the greasiness disappeared completely but on my face it subsided to a tolerable level because I had used a sheet mask that's a bit sticky before hand. I noticed that my skin does feel a little smoother afterwards. I do not like the heavy emollient feel, therefore I am passing on this one. Since I already have a hydrating essence from Neogence, I won't be purchasing any of the Innisfree Seawater Essences in the moment, but in the future if I ran out of hydrating essence I will surely get the regular Jeju Lava Seawater Essence for myself.